The Spanish “Costa del Sol” is the most glamorous, all year round, tourist destination in Spain. It has many miles of sub-tropical beaches. Marbella – Puerto Banus is located in the heart of the “Costa del Sol”. It is full of luxury apartments and villas, it offers the traveler a marvelous holiday lodging very close to all types of amenities: golf courses, water sports, tennis courts, swimming pools, sunny ski resorts (Sierra Nevada,1.5 hour drive by car), high standing fashion shops, restaurants, pubs, etc. Puerto Banus is famous for its harbor filled with spectacular private yachts. Boat rentals are available for every type of water activity. Choose amenities such as a high power waterproof boat stereo system, complete with excellent marine speakers, fishing and water ski equipment and much more. Charters and cruises are also available to tour the Spanish coast line. Enjoy Puerto Banus’ fashionable boutiques, restaurants and nightclubs. You will find everything you could want on a holiday: sunny and dry weather even in winter, sandy beaches, exclusive fashion shops, good restaurants, sport facilities, and a dazzling nightlife just a few meters away. Marbella – Puerto Banus is full of luxury apartments/villas for rent, hotels, and other vacation rentals. We are excited to offer vacation rentals in 2 dazzling locations. Las Terrazas de Banus apartment complex is located in the central square of Puerto Banus, very close to the marina and all its amenities – just to cross the street – and the beaches “Levante” and “Benabola”, aprox. 150-200 metres from the complex. It is a modern building -finished in 2000 – with a big garden – 10000 sq metres – and 4 pools. The apartments are very sunny – South-West oriented – overlooking the garden. Marina Banus apartment complex is also located in the very center of Puerto Banus, very close to the marina and all its amenities -just to cross the street- and the beaches “Levante” and “Benabola”, aprox. 150-200 metres from the complex. It is a modern building complex -finished in 2000- with big terraces, cinema gallery, shopping center and pools. 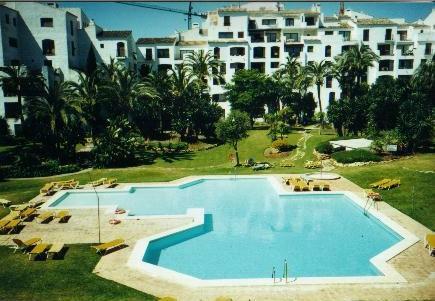 The apartments are very sunny – South-West oriented – overlooking the central square of Puerto Banus. We are committed to meet a high quality standard in every service provided. Flexibility, trust, and quality service are our motto.